Cloud eggs is the new kale/black or whatever the new trend is. So I had to try it. Normally I'm not a big fa of baked eggs. The rubbery texture of baked eggs do not agree with me. So the fluffiness of the cloud eggs could be the solution for a baked egg in my world. Plus adding cheese and ham to the egg, makes it a home run in my book. Preheat the oven to 450℉ (230℃) and line a baking sheet with parchment paper. When I divide the eggs, I place each yolk in its own little prep bowl, making it easier to place the yolks on their own little cloud. Whip the egg whites until stiff peaks. Gently fold in cheese, ham, and season with a little bit salt and pepper. Place the 4 mounds of the egg whites, making the mounds so they look like little nests (clouds), with an indentation in the center. Bake for 3 minutes, and remove from oven. Carefully place a yolk in each cloud, sprinkle with a little pepper. Bake for another 3 minutes, until the yolks are just about to set. Serve immediately with a sprinkle of chives on top. Eggs in mustard sauce is a classic old Danish easter lunch dish eaten Saturday before easter. In Denmark easter is two sets of two religious holidays. Skærtorsdag (Maundy Thursday), Langfredag (Good Friday), Påskedag (Easter Sunday) and 2. Påskedag (Easter Monday). In between the sets of religious holidays, is Saturday. This Saturday called skiden lørdag (dirty Saturday . because it was used to clean up from all the entertaining Thursday and Friday, and make the house presentable for more entertaining during the easter days. So the Danes wanted an easy dish to serve on this busy day, and the dish eggs in mustard sauce was born, and got the weird name dirty eggs or skidne æg. In my family we didn't have egg hunts or easter egg roll. We got easter eggs, and we had the first of the 3 big family lunches of the year. I loved these lunches, because it was here we saw all our cousins and extended family. And we alway went for a walk in the forest close to my aunts house, and we saw the first real signs of spring, with the small flowers under the trees. Bring a small pot of water to a boil. Carefully add the eggs and boil until a little more than soft boiled. I cooked my large eggs for 7 minutes. Cooking time varies depending on egg size. Drain the water from the eggs, and pour cold water into the pot to stop the cooking. Peel the eggs and set aside. While coking the eggs make the sauce. Melt the butter in a small pan, you don’t want the butter to brown. When the butter is melted add flour and a pinch of salt and whisk vigorously, making the flour absorbing all the butter. Add the milk a little of a time, while whisking, until you have the right consistency, like a béchamel sauce. Let the sauce cook for 1-2 minutes, this with remove the floury taste. Season the sauce with mustard, salt and pepper. You want to have a strong mustard taste, so use your favorite non-sweet mustard. Add boiled eggs to a serving dish, and pour over the sauce and sprinkle with cress sprouts. Serve the eggs with a slice of toasted danish rye bread. Egg salad is one of the easiest things to make. When the eggs are boiled and cooled, it will only take 5 minutes to make. And it still packs great flavor. I might not be the healthiest but add a good salad and some vegetables on the side, suddenly you have a great meal. Everybody has their way to boil eggs. I put the eggs in a small saucepan and just covered with cold water. Over high heat bring the water to a boil, let the eggs cook in the boiling water for 7 minutes. Remove from heat, drain the water and stop the cooking with cold water. Mix all the ingredients together and season with salt and pepper. Serve the egg salad on your favorite bread. I really love poached eggs, the soft but firm white and the creamy and runny yolk. It's the soft boiled egg I grew up on, made better. But I have tried to make them several times, and with no luck. They turned out like hard boiled eggs to soft eggs (smilende) but still to firm to be a poached egg. I needed a fool proved method, I just hadn't found it yet. Until a day after an hour at the gym, where I really craved a poached egg. I googled and found Simplyrecipes.com and her "Easy Poached Eggs." That day I had my first perfect homemade poached egg. I have to spread the news on how to poach an egg. I hope you will enjoy a perfect poached egg in you near future. Eggs in general: When you want poach eggs, you need to use fresh eggs. When you crack the egg you can tell that you have a fresh egg, when the yolk is firm and plump, and the white consist of two parts: a gelatinous mass around the yolk and a runnier liquid. As the egg ages, the white becomes more runny. So the runnier the white, - the older the egg. If the egg sinks and lays flat on the bottom, it's very fresh. If the egg sits on the bottom at an angle,it's a bit older. If the egg stands on end but still sits on the bottom, use for baking. If the egg floats, it is old and you don't want to use it. First bring water in a saucepan to almost boiling. If the water is already boiling, lower the heat until it is no longer boiling. At this point, you can add one or two teaspoons of vinegar to the water, if you want. The vinegar will help the egg whites to coagulate easier. Working with the eggs one by one, crack an egg into a small cup. Use the slotted spoon to quickly stir the water in one direction until it's all smoothly spinning around like in a whirlpool. Use the whirlpool method for one or two eggs. For bigger batches do not stir. Place the cup near the surface of the hot water and gently drop the egg into the water. With a spoon, gather the egg white closer to the yolk. This will help the egg white hold together. Turn off the heat. Cover. Let sit for 4 minutes, until the egg whites are cooked. Lift eggs out of pan with a slotted spoon. Serve immediately. Alternatively, place the egg in an ice bath and refrigerate up to 8 hours. Reheat in warm water just before serving. 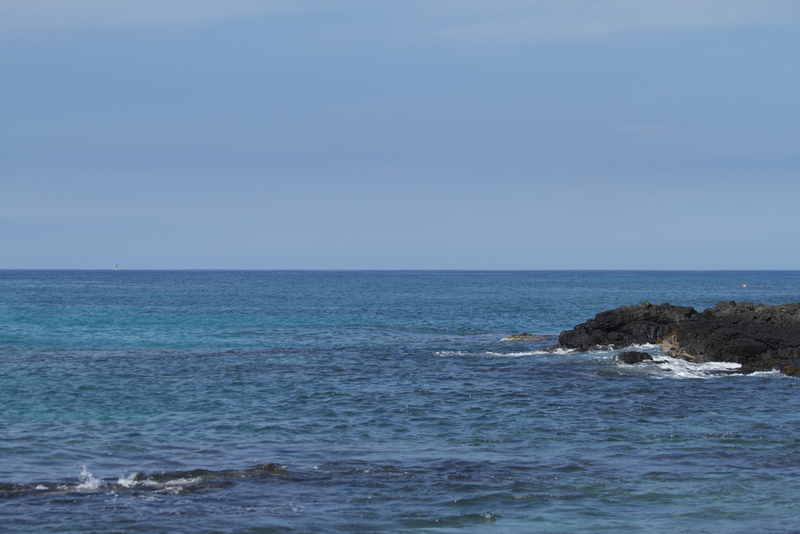 On my first vacation to Hawaii, I had a Waipi'o Stack Breakfast at Island Lava Java. One of the best breakfasts ever. I crave salt for breakfast, so for sure the Waipi'o Stack is right up my alley. Well, the setting didn't hurt the experience in any way. 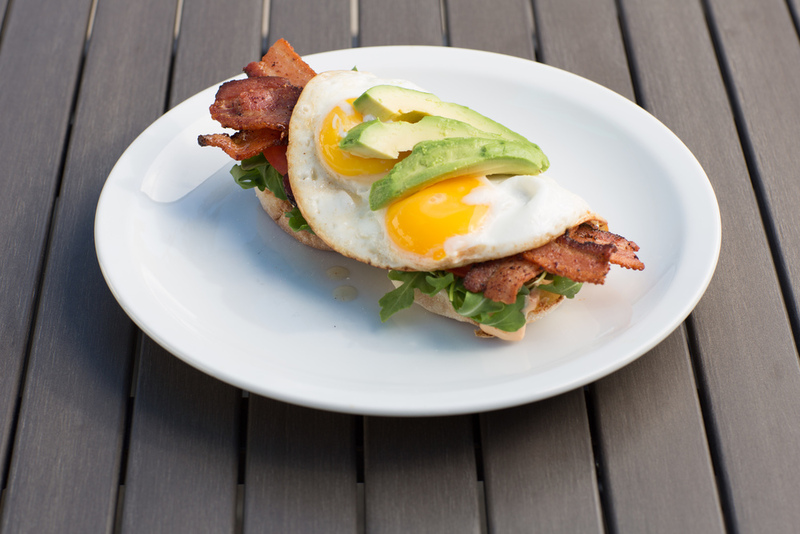 The Waipi'o Stack is two eggs over easy, stacked on wheat toast with applewood smoked bacon, fresh avocado, tomato, arugula and chipotle aioli. The view from the cafe. Cook the bacon until crisp using your favorite way, in a skillet, in the oven or in the microwave. Set aside. Rinse the arugula, and pad it dry in a kitchen towel. Wash and slice the tomato; peel and slice the avocado and toast the bread. Crack eggs in two bowls, two eggs in each. Heat a small non-stick skillet over low heat and add butter. As soon as the butter stops foaming, add two eggs to the pan. Cook eggs over low heat until the whites stops being translucent. Now gently flip the eggs with a spatula/turner, be careful not to break the yolks. Count to 10 and flip the eggs back or put at plate upside down on the pan, and flip the whole thing. Spread chipotle aioli on bread, add arugula, then tomato slices, bacon and eggs. Place the avocado on top. Serve immediately with a cup a fresh fruit. Rist brødet og steg baconen. Bland mayonnaise med chipotle. Spejl æggene. Smør brødet med mayonnaisen, læg rucolaen på, derefter tomatskiver, den stegte bacon og til sidst læg æggene på. Skær avocadoen i skiver og læg dem ovenpå æggene.